The tube-like structures embedded within the rock. New research published Monday in Proceedings of the National Academy of Sciences suggests ancient life on Earth had acquired the capacity for self-propelled locomotion at least 2.1 billion years ago, and not 570 million years ago as previous research suggested. The evidence for this apparent locomotion, also known as motility, was presented in the form of tiny fossilized wriggle marks embedded within ancient sedimentary rocks. 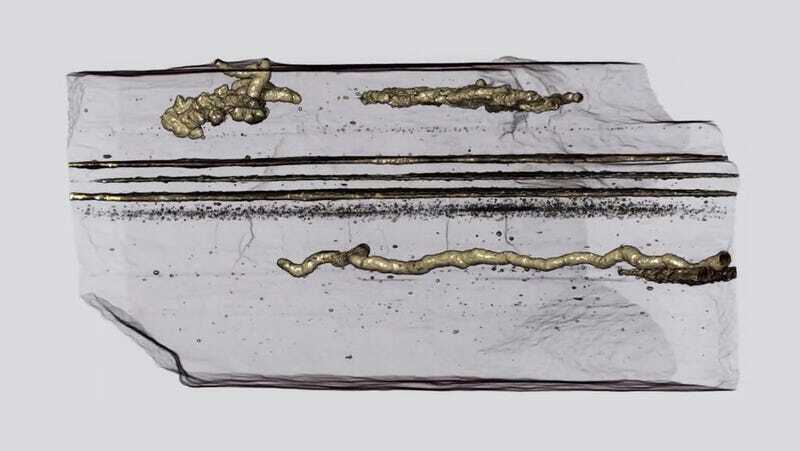 X-ray imaging revealed the tube-like structures embedded within the sedimentary rock. Back in 2010, the lead author of the new study, Abderrazak El Albani from CNRS-Université de Poitiers, discovered the earliest evidence of complex multicellular life at the Francevillian Basin in the Haut-Ogooué Province of Gabon in central Africa. Dated to 2.1 billion years old, the fossils were 1.5 billion years older than the previous benchmark of 600 million years ago. This ancient life, the authors surmised, lived in shallow marine environments with sufficient access to oxygen. The new fossils, also discovered at the Francevillian Basin, suggest some forms of this ancient life had evolved the capacity to propel themselves through organic-rich mud on this shallow seafloor. The fossilized wriggle marks found inside of these rocks, according to the new research, are the tunnels left behind by these primitive creatures as they squirmed around in search of nutrients. If confirmed, it would be the earliest evidence of motility in eukaryotic life, that is, lifeforms with complex cells and a clearly defined nucleus. For the study, El Albani and his colleagues applied chemical analysis, scanning electron microscopy, and x-ray computed microtomography, the latter of which allowed for the crystal-clear 3D perspective of the squiggles embedded within the rock. The string-shaped, tubular structures, of which 80 were detected, measured around 6 millimeters wide and stretched to a maximum length of 170 millimeters. Some of these apparent tunnels were intertwined, extending both vertically and horizontally. Chemical analysis suggested the features were the result of biological, and not geological, processes, and appeared at the same time the sediments were laid down. The organic matter found within the rock “could either be a body that decomposed there, or a mucus left by the organism, similar to a slug’s trail,” explained El Albani in the statement. These features were located near fossilized microbial mats (layered sheets of fossilized microorganisms). The authors speculate that the apparently mobile eukaryotes were moving around in the muck in search of nutrients produced by the cyanobacteria responsible for the microbial mats. Importantly, Earth was already oxygen-rich by this time, making the emergence of complex life a distinct possibility. Fascinatingly, the tunnels weren’t formed by a single individual, but rather by a mass collection of them, according to the new research. These primitive eukaryotes, dubbed “Gabonionta” by the authors, clustered together en masse, forming a slug-like shape. This allowed them to move through the mud—both in vertical and horizontal directions—in search of food and areas rich in oxygen, similar to how modern colonial amoebas do it. So technically speaking, these creatures were mobile, but they achieved their mobility through collective group action, according to the new research. The authors don’t know if this was a one-time thing—a kind of failed experiment—or an important evolutionary precursor to motile life. After this period of Earth’s history, a major glaciation period on Earth caused oxygen levels to plummet dramatically, making life for the putative Gabonionta exceptionally difficult, if not impossible. They could’ve been wiped out, with motility re-appearing in another species many millions of years later. Or they managed to survive, setting the groundwork for a critically important evolutionary adaptation. The claim that self-propelled eukaryotes existed 2.1 billion years ago is quite extraordinary, no doubt. From here, other researchers should take a look at the samples themselves to corroborate the findings, while also continuing to search for more fossils. If confirmed, however, this discovery means complex life emerged relatively early in Earth’s history, and it wasted no time developing the means for self-propelled locomotion. Primitive life, it would seem, was eager to get going.